Growing up my dad never cooked. He never baked. 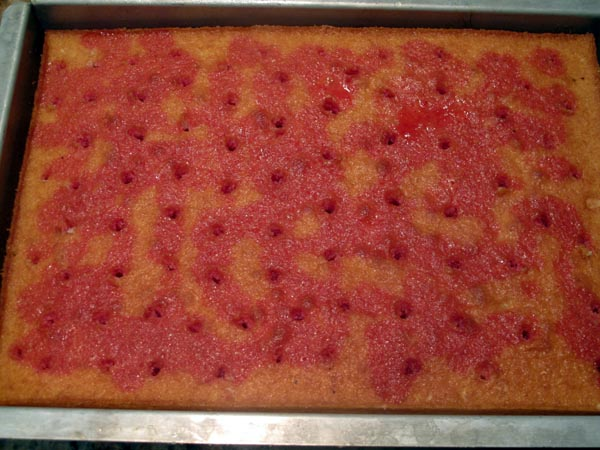 But I have one memory of him baking one thing the entire time I lived at home and that was Strawberry Poke Cake. He LOVES strawberries and he LOVES whipcream. He didn't really teach me this recipe but it's so easy it just kind of stuck with me, I'm sure you'll love it too.. Note: The frozen strawberries will need a fair amount of time to thaw in a strainer/bowl because you will need to save the juice so please plan accordingly. Make the cake according to the directions on the back of the box..while the cake is baking in the oven you will begin making the topping. Topping: Empty the whipped cream into a large bowl - the entire container of cream. Fold the frozen strawberries into the whipped cream, this will end up being very "chunky" with all the strawberries. Put it in the fridge until you need it. **this is not my picture, but this is what it will look like after you've put the juice in it. 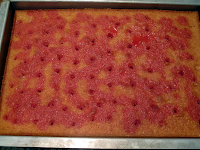 When the cake comes out of the oven it will need to cool completley then with a fork poke holes *not all the way to the bottom but mostly through the cake, then spread the hole's with the fork and with a spoon pour a small amount of strawberry juice into the hole's. Do this throughout the whole cake in random places. The juice will soak into the cake! Once you've done this then spread the whipped cream/strawberry mixture over the top of the cake and enjoy! We make this for birthday's, bbq's, and any other occasion you can think of and sometimes we make it just for fun!